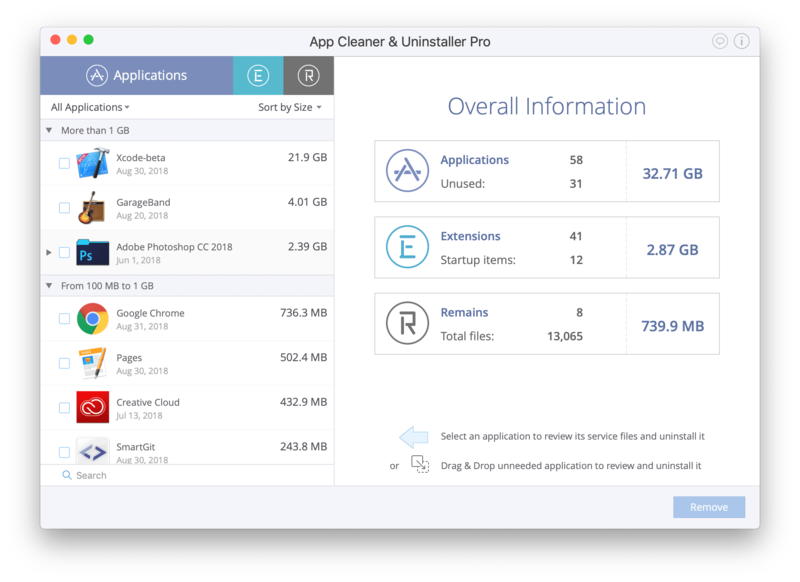 App Cleaner scans all applications installed on a Mac and finds the service files for each application. Moreover, it finds and shows leftovers (Remains), which are service files that may be left on your Mac from applications that have already been trashed. This happens when you delete an app incorrectly by just dragging and dropping the app’s icon into the Trash folder. You should clear remains on your Mac, as they can occupy a significant amount of disk space. Use App Cleaner for this purpose. Click “R”-panel in a left head section or use a CMD+2 shortcut. Choose the files and click the Remove button to get rid of them. It is important to uninstall applications correctly so that no useless leftovers remain on your Mac. You can also clean up caches and other support files of apps periodically to free up some space on your disk.